It's the first May Bank Holiday weekend, hurray! I'm sure you have lovely dinners & gatherings planned for this long weekend, so when vegetarian friends come over and you need something impressive for them, this is the recipe for you! I stumbled upon it thanks to my mother, who is always on the lookout for new recipes. She gave me her recipe, but I changed it a bit, to make it more interesting. 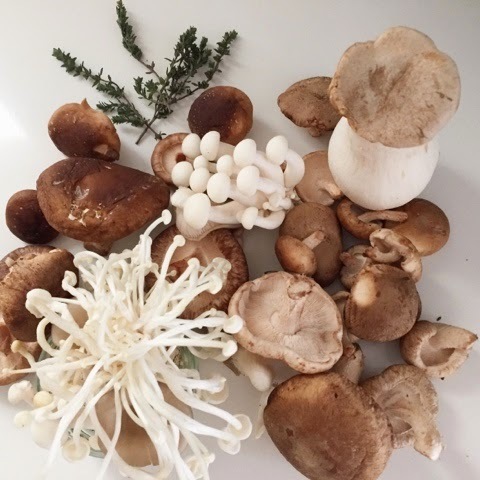 The trick is to use different mushroom kinds, in order to provide different textures, otherwise mouthful after mouthful of the same mushrooms can be quite plain. If you think I spent a fortune on these mushrooms, think again. As a matter of fact, our local Sainsbury's happened to offer a selection of assorted mushrooms and then I topped it up with a couple of other varieties. I'm sure other supermarkets offer similar varieties and if you happen to have a farmer's market close to you, even better! There is no rule, just mix & match and keep it interesting. Start with the mushrooms, don't wash them. Brush them instead, to get rid of any dirt that might still be on them. Treat the mushroom individually depending on their shape and texture. Split the enoki by hand in long strands for example, they create a pasta-like texture later. Do the same with the shimeji, no need to cut them further, as they will shrink. Tear the oyster ones apart in large chunks. Cut the King Oyster ones in flat long pieces, much like fillet, in a way. Finally, cut the chestnut ones in cubes. This will create different textures and consistencies once all of the mushrooms are cooked and bathed in the garlicky-thyme butter. Warm the olive oil in a broad pan and add the garlic and thyme. Once the thyme starts sizzling, add the mushrooms. On medium heat, keep tossing them around gently, in order to avoid creating too much steam. The mushrooms should remain juicy and not lose all of their water. But you don't want them to taste plain fried either. After 5 minutes once they are almost cooked, add the nob of butter and the Cassis, salt & pepper. Toss around for another 3 minutes and take them off the heat. Put the mushrooms aside to cool down. Lay out the shortcrust pastry on a slightly floured surface. 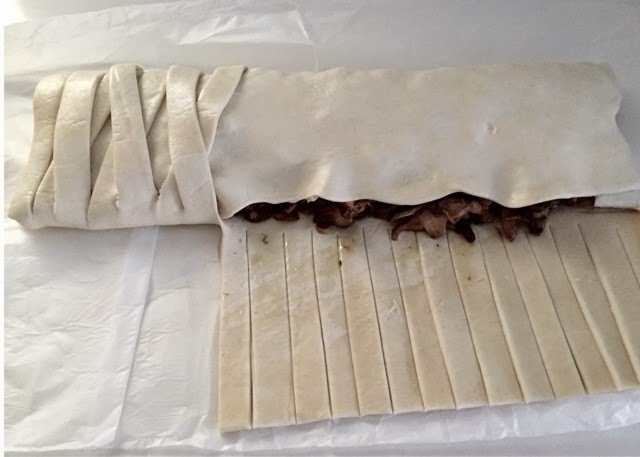 If it comes in baking paper, leave it on the paper, it will be easier to transfer it to a baking sheet later. You mustn't let the pastry get too warm or it will be difficult to handle, so work quickly. 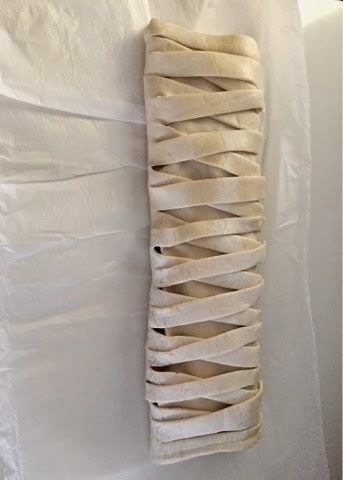 If the pastry is already rolled out you might want to roll it further, to make it thinner and the surface bigger. Try to maintain the rectangular shape though. Imagine that the rectangle is split in three pieces, lengthways. Do not cut it in three pieces however, just plan it out visually. Lay out the cool mushroom mixture in the central piece. fold the top and bottom end in over the mushrooms. Use the right piece to fold over the mushrooms, like a little blanket. Then take your knife and divide the left piece in long strands, up to the mushrooms line. Make sure they are still attached to the central piece though. 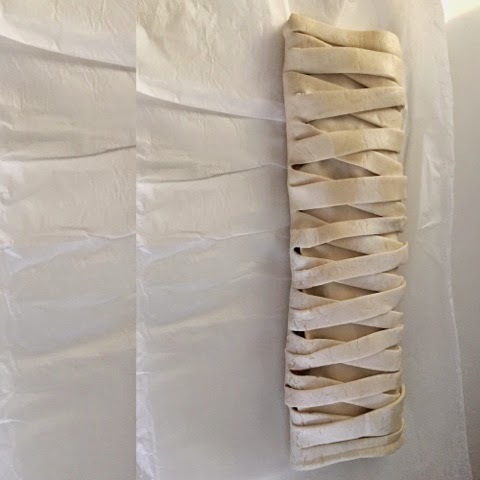 Fold each strand over the right piece of pastry, interlining them over each other, to create the usual strudel pattern. Transfer to a baking sheet. Bake in 200C for 30 minutes, or until the pastry is golden. Unfortunately, I did not manage to take any pictures once the Strudel was out of the oven, my guests attacked it quite rapidly. But take my word, it was all puffed up and golden and went down a treat!